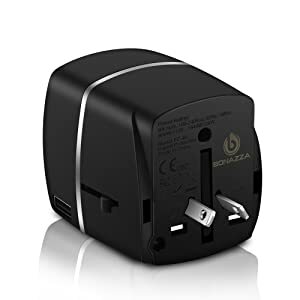 BONAZZA Travel Adapter has 4 USB port, supports with ultra-fast charging for connected devices. This is a real socket saver or space saver. Can be charged to any USB device, such as cell phones, iPhone, iPad, Power Bank, MP3/4/5, GPS, Cameras etc. 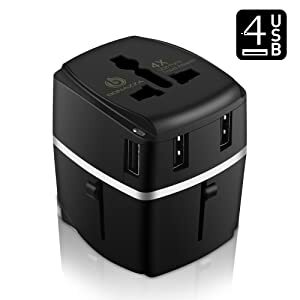 to share 4 USB ports when traveling with family and friends or use as Multiple USB charger at home or office. 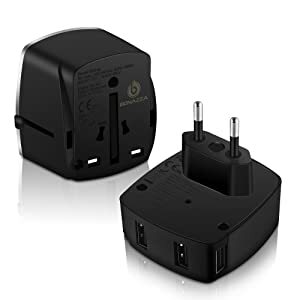 Including 4 USB ports (total: 3.4A) that can charge multiple USB devices at once in worldwide. Comes with a nice carrying pouch. WARNING: BONAZZA travel plug adapter FITS power sockets of type A, B, C, E, F, G, H, I, J, K, L, N. Before you purchase, please make sure this plug adapter can be used in the country you travel to. 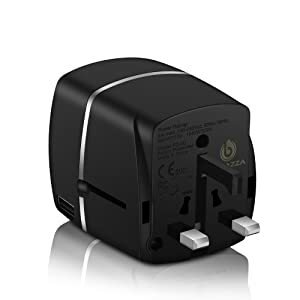 The power socket DO NOT convert the voltage, to avoid possible damage to your appliance, ONLY USE appliance with DUAL VOLTAGE. Other Countries include: American Samoa / Antigua and Barbuda / Aruba / the Bahamas / Barbados / Belize / Bermuda / Brazil / Canada / the Cayman Islands / Colombia / Costa Rica / Cuba / Ecuador / El Salvador / Guam / Guatemala / Haiti / Honduras / Jamaica / Japan / Liberia / Mexico / Micronesia / Montserrat / Nicaragua / Okinawa / Panama / Peru / the Philippines / Puerto Rico / Saint Kitts & Nevis / Saudi Arabia / Tahiti / Taiwan / Thailand / Trinidad and Tobago / Venezuela / the Virgin Islands, etc.